According to Tony Rayns, Li Shaohong first read An Dun's story—on which Stolen Life was subsequently based—with a sense of mounting dread, which intensified when she realized Dun's fiction was based on a true story about a man who seduced and impregnated women in order to sell the babies. 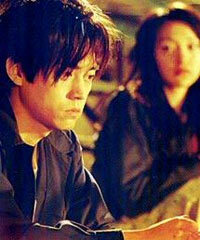 Initially conceived as part of a fact-based series about the lives of contemporary Chinese women, Stolen Life was blown up to 35 mm and shown at the 2005 Tribeca Film Festival, where it won "Best Narrative Feature." Robert De Niro presented the award to Shaohong along with its $25,000 prize. It has now been selected to be one of the eight features showcased by Global Lens 2006, and one of the three involved in their educational outreach program to high school youth. Shaohong tackles a difficult conceit. She asks her audience to suspend disbelief even as from the onset of the film her protagonist—Zhao Xun as the infuriatingly naïve Yan'ni (and last seen in Peter Chan's Perhaps Love)—omnisciently recalls via narrative voiceover the inevitable folly of suspending disbelief. "Although the narrative voice is omniscient," Bill White specifies, "the story is contained within the ignorance of the moment, creating a stimulating contrast between what is experienced and what is remembered." So even as Yan'ni leaves her joyless home life to study at the university, and her future is poised to reveal itself, anticipated brightness is forfeited for immediate despair on her very first day away from home—most notably through a chance encounter with Muyu (Jun Wu), a handsome delivery truck driver, who beguiles Yan'ni with a love she has never known and a hat that looks just like hers. Surely that means they are kindred spirits? But Muyu, as Variety's Ronnie Schieb quips, "is full of unwelcome surprises, like a chance-discovered infant and cleaver-wielding wife." To Shaohong's credit—despite our knowing what's going to happen to Yan'ni in her misguided love for Muyu—you still care enough to watch her come to consciousness. As Amy Taubin states it: "What's marvelous about the film, besides the way Li's supple DV camera follows the young woman like her own shadow, is the way she gradually overcomes her pain and desire for revenge and finds agency through her misfortune. Together Li and her expressive lead actress convince us that this change, rather than being grafted on to fulfill a political agenda, comes from within the young woman herself." (The italics are mine because I adore Amy's clause; it's lovely.) Bill White writes that Zhao Xun achieves a "quietly implosive performance that captures the serenity of despair." The film becomes not so much a cautionary tale about the perilous morality of unwed mothers—though it certainly tweaks all that melodrama—but more a tone poem where the tone is the selfsame mounting dread Shaohong experienced when first reading the story. This is evocatively rendered by what became my favorite aspect of the film: its sound design, structured by Young Wang. Yan'ni's stubborn and taciturn silences are contrasted by the periodic use of a loud, rushing slamming sound that effectively and repeatedly unnerved me. The sound suggested unavoidable collision. I kept thinking something horrible was about to happen. When Yan'ni in vengeful anger goes shopping for knives, I braced myself for bedrooms of blood. Thankfully, Shaohong doesn't take that easy route, and achieves more with less through her dispassionate treatment of events, emphasizing that what is truly horrible is the stolen life of the film's title: not only Yan'ni's own hopeful youth but her firstborn. The glimpse into Beijing's "underground city" where Yan'ni and Muyu create their love nest is an intriguing attraction to the film. It seemed almost mythic to me, parallel to the marriage descent of Persephone. Mention must be given to Bérénice Reynaud's insightful take on the film for Senses of Cinema. Reporting from the 24th Vancouver International Film Festival, Reynaud opines: "Repetition can be a psychological pattern—or an aesthetic device." Then proceeds to flesh out the theme: "Much later [Yan'ni will] understand that her mother's apparent coldness was an awkward way to try and protect her from making the same mistakes and giving up her future for a man unworthy of her. Yet, Yan'ni can't wait to 'live her life'—even if it means squandering her chances for a college education as soon as she meets Muyu …. Unknowingly, she finds herself trapped in repetition: not only—horror!—of her mother's life, but also—horror of horrors!—of the lives of the other women who have been seduced and swindled by Muyu. As the screw turns and the melodrama thickens, I found myself recoiling—no, it's too much, no woman would be that clueless, that gullible. Yet, it's based on a true story, and in real life, while horrible things do happen to women, most of them display a surprising resilience that goes beyond the stifling confines of melodrama. In the last part of the film, Yan'ni gets a hold of herself and takes stock of what her possibilities are. Maybe she needed to have her entire life 'stolen' from her, to realise who she really was." Bay Area audiences will have several opportunities to see Stolen Life at one of the various venues for this year's Global Lens. On Wednesday, September 6, at 7:30 p.m. it will be screened in San Francisco at the San Francisco Art Institute. At last night's press conference it was announced that Gary Meyer has agreed to The Balboa Theater being an additional San Francisco venue for Global Lens and Stolen Life will screen at the Balboa on Saturday, September 9 at 11:00 a.m. Stolen Life will screen at the Grand Lake Theatre in Oakland on Thursday, September 14 at 7:00 p.m.; on Friday, September 15 at 7:00 p.m.; on Saturday, September 16 at 9:30 p.m.; on Sunday, September 17 at 9:30 p.m; on Monday, September 18 at 7:00 p.m.; and finally on Tuesday, September 19 at 9:30 p.m.
At its final venue, the Smith Rafael Film Center, Stolen Life will screen on Friday, September 22 at 8:45 p.m.; Sunday, September 24 at 8:45 p.m.; Tuesday, September 26 at 8:45 p.m.; wrapping up on Friday, September 29 at 6:30 p.m.
08/09/06 UPDATE: Via filmbud Michael Hawley, if you're nostalgic for the days of Peter Scarlet and his thoughtful film introductions, indieWIRE reports that Link TV begins a weekly film series called Cinemondo on August 26. Here in the Bay Area Link TV can be found on DirecTV channel 375. Of note is that three of the films scheduled for the Cinemondo series are part of the Global Lens fare; namely, Stolen Life, Almost Brothers and Border Café. Very romantic photo shooting in the movie.